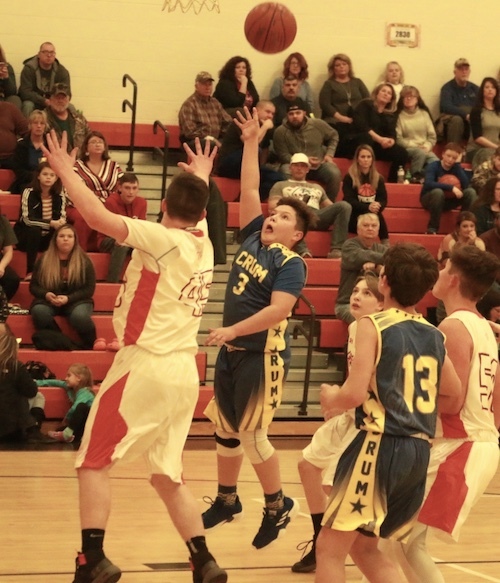 FORT GAY, W. VA. — In a rival game anything can happen and when Fort Gay and Crum play it usually does as the Vikings shook off a scoreless third quarter to even the regular season series with the 25-19 come from behind victory over the Mountaineers Thursday evening at the Fort. Chevy Watts with bucket to put the Vikings up 4 points late in the game. The Vikings were led by Chevy Watts and Colton Austin with 9 points apiece, Ben Clayton 4 points, Kaleb Walker 2 points and Tyler Salmons rounded out the scoring with 1 point. Fort Gay is now 4-9 overall and 2-4 in Wayne Co. action. The Vikings have lost 5 games by one point. Bray Mollette scoring 2 of his team leading 9 points vs Fort Gay. 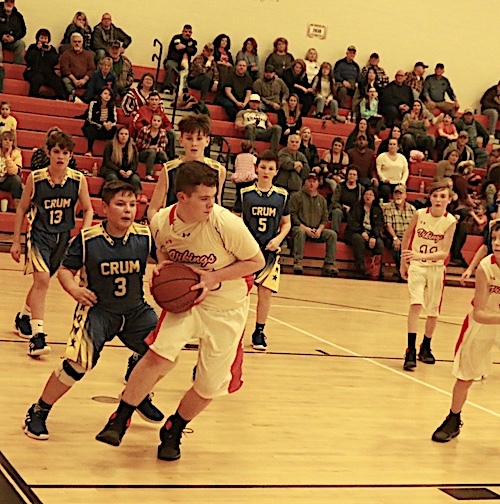 Crum was led by Bray Mollette with 9 points, Cameron Ratcliff and Parker Watts 4 points each and Ford Scaggs chipped in with 2 points. Kaleb Walker pulling down a tough rebound in a victory over rival Crum. In the first game of the night it was Fort Gay racing past the Mountaineers. Luke Fetherolf led the Vikings with 13 points, Peyton Marcum tallied 12 points, Josh Hofmeister 8 points, Evan Ball and Cole Jordan 4 points each, Lamar Davis 3 points, Hayden Pennington 2 points. Cole Blackburn led Crum with 11 points, Brady Vance and David Meddings 3 points each, Nick Block 2 points. Last week the Vikings picked up win number one in Wayne Co. action as they out lasted the Pioneers in a foul fest. Colton Austin poured in 23 points to led the Vikings, Ben Clayton tallied 10 points, Tyler Salmons and Luke Fetherolf had 5 points each, David Dingess 2 points and Chevy Watts 1 point. 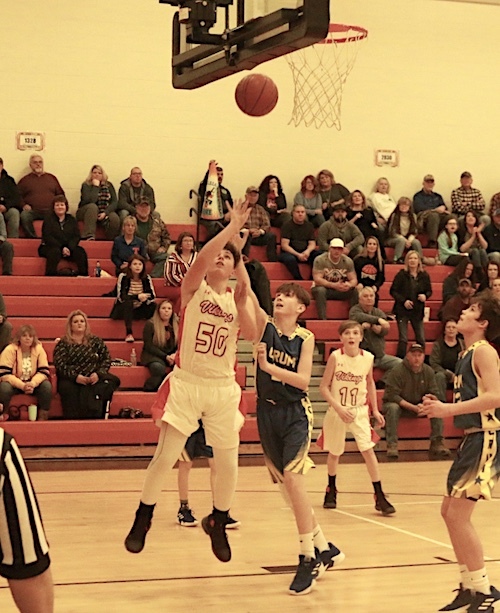 Zane Adkins and Isaiah Lowe led the Pioneers with 8 points each, Porter Brumfield tallied 7 points, Dillon May 5 points, Ike Meddings and Lucas Queen 4 points apiece, Kaden Watts 2 points.